Weather is getting better and impelling everyone in my house to get involved in outdoor activities. Kids enjoyed their Spring break which meant no homework and just playtime. I too even signed up for a 5K marathon with my friends. I have not taken part in single sports during my school or college days and it was surprising when I told this to my family. The aches and pains of running had waken an indolent person, but giving up is not an option when you are in a team, so I am striving my best. Honestly it's been one week now I had done any practice. Few of us have decided to just walk and finish the 5K if we cannot run, so that is the alleviating hope I have. There are only 3 more weeks for the Marathon and I am still not as enthusiastic as before when I started the practice. I have to focus and start practicing soon!!! 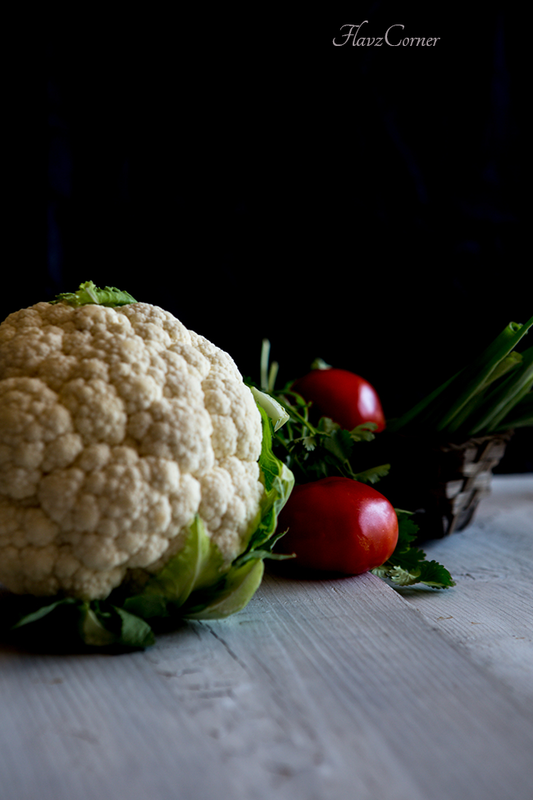 Since the start of Spring, cauliflowers are abundant in the market and you see lots of innovative recipes with this beautiful flower in the web. 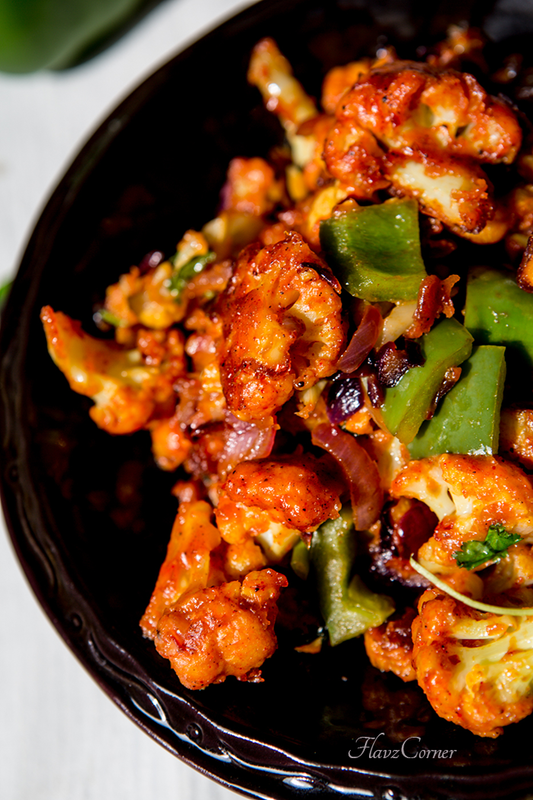 I too tried a healthy variation of the regular Indian Gobi Manchurian recipe which is a deep fried dish made with battered cauliflower seasoned with some oriental sauces and bell pepper. There are dry and gravy versions of this dish. But the healthy version I made here is the dry version that was baked and could be enjoyed with Indian flat breads like Naan, Roti or Chapthi. This can also be served with vegetable Pulao. My whole family loved it to the core when I served it with Rotis. Not only the baked version is healthy but also the ease in baking instead of frying batches of the battered cauliflower is the best thing about this recipe that would incite you to give this recipe a try. Separate the florets into bite size and wash. Boil a pot of water with salt to taste and 1/4 tsp of turmeric powder. Add the cut cauliflower florets into the boiling water and cook for 3 - 4 minutes. Drain the florets in a colander. Mix all the ingredients from the batter list to make a thin batter. Coat the drained florets with the batter. Adjust the salt. Discard the remaining batter. Transfer the coated florets on greased baking sheets. For medium size cauliflower you need atleast 2 baking sheets. Drizzle 1 tbsp of oil on the florets or apply cooking spray over the florets. Make sure that the forets don't touch each other and bake for 25 - 30 minutes by rotating the baking sheets and flipping the sides of the florets in between or till the florets are crispy. Take a cast iron wok or non stick pan, spluter 1/4 tsp of mustard seeds in 2 1/2 tbsp of oil. Add the cubed green pepper and saute for 3 - 4 minutes on medium to high heat. Transfer the sauteed peppers into a bowl. To the same pan add the chopped onions and minced garlic and cook till light brown. Now add the soy sauce, garlic chili sauce and tomato chili sauce. Add the baked cauliflower florets. Mix well in the sauce and cook for 3 - 4 minutes. Now add the sauted green peppers and cook for another minute. Turn off the flame and garnish with chopped cilantro. Serve this yummy dish with Naan, Roti or Chapathi. Make sure that the batter is thin. A thicker batter will end up in uncooked flour coating and ruin the dish. Adjust the sauce according to your spice level. The Machurian tastes better when they are warm and served on the same day. Thanks Rafeeda!! Trust me the baked version has no taste difference than the deep fried version. We loved it so much. I had made it few times now. Thanks Rekha!! Let me know how it turns out for you. What a great recipe! Cauliflower has such wonderful flavor, particularly when it's spiced this way. Running really can cause some aches and pains (ask me how I know!). Good luck with that, and thanks for a really super recipe. Thanks John for the lovely comments!!! It looks D-e-e-e-licious Shibi! Yum! deep frying is the only things which keeps me away from making all manjurians often as i like..soo kudoos to u for giving the idea of baking...I m going to try it soon...Thank u thankuuu..
Love the healthy spin to this delicious dish. Excellent ingredients, cauliflower and turmeric go so well together! 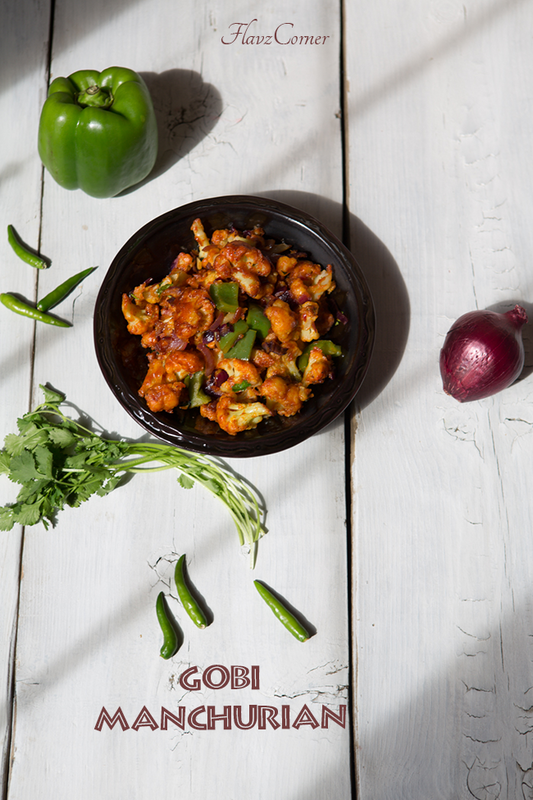 The baked gobi manchurian looks spot on and so tempting. Oo, this looks really tasty. I love, LOVE baked cauliflower in general, but the flavor profile in this dish sounds really intriguing. Very nice post. Thank you so much for sharing.